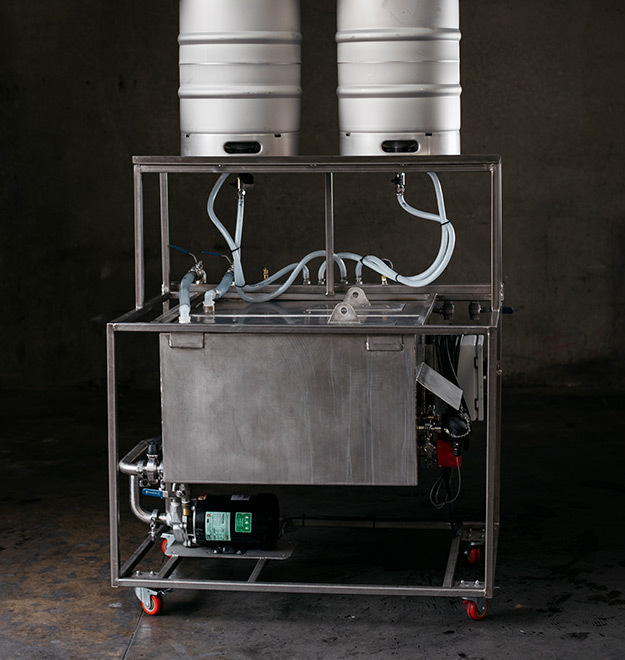 Our keg washers come ready to plug in and go. Here are some instructions on how to get washing. Close the city water valve, briefly open compressed air valve to push out residual rinse water, then close the compressed air valve and the drain valve. Open the cleaner reservoir return valve “B”, open the cleaner reservoir drain valve “1”, open the pump outlet valve “A”, and turn the pump on. Allow cleaner to cycle through the kegs for one to five minutes (consult your chemical supplier for recommended clean cycle timing). Turn off the pump, close the cleaner reservoir drain valve, briefly open compressed air valve to push residual cleaner back into the cleaner reservoir, close all valves. Open the drain valve and briefly open the city water inlet valve to flush out residual cleaner, close all valves. Open the sanitizer reservoir return valve “C”, open the sanitizer reservoir drain valve “2”, open the pump outlet valve “A”, and turn the pump on. 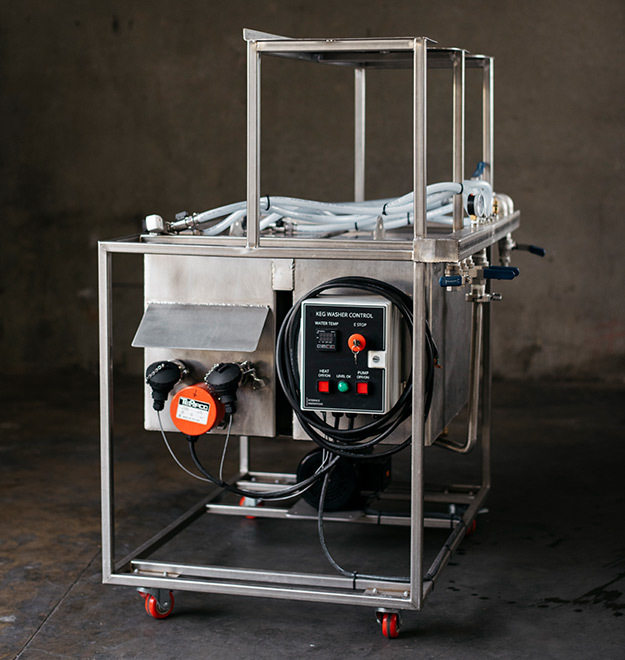 Allow sanitizer to cycle through the kegs for one to five minutes (consult your chemical supplier for recommended sanitizer cycle timing). 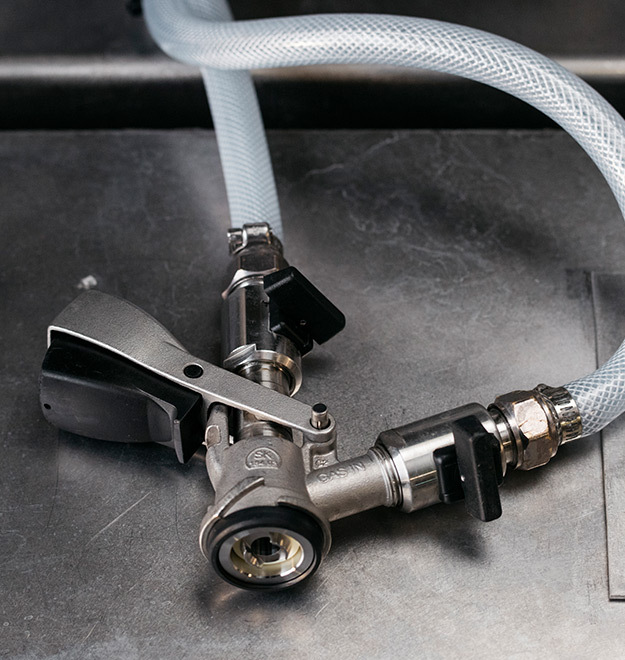 Turn off the pump, close the sanitizer reservoir drain valve, briefly open the CO2 inlet valve to push residual sanitizer back into the sanitizer reservoir and purge all oxygen from kegs, then close all valves. Optional: Slowly and carefully open the CO2 inlet valve to pressurize kegs as desired. The keg cart is equipped with a pressure relief valve “P” with a spring set to 60psi (the most common maximum pressure rating for a stainless steel keg). Ensure that the pressure relief valve is periodically cleaned, tested, and in good working condition.